Cylindrical reinforced concrete tanks and silos applied for the needs of storage of water or other media: single chamber or double chamber with an internal bulkhead. The fact of employment by the company of Globtank of the latest IT solutions, which allow for the project design of various objects based upon the 3D technology as well as based upon the method of completed elements, has allowed us to reach the perfection within the scope of optimisation of the quantity of indispensable materials (i.e. steel and concrete), as well as the shapes of tanks and silos the fact that directly translates to the lower costs of manufacturing (smaller consumption of materials, faster execution, standard materials, own scaffolding supports and structures) as well as to the lower cost encumbered by our Clients. The project and organisational perfection does not influence the quality of the tank itself, nevertheless the materials employed by Globtank are most frequently of much better quality than those “traditionally” applied. Each and every of our projects is prepared by engineers holding adequate certificates and authorisations and is concluded in accordance with the obligatory standards of the Building Law. The enhancements proposed by the company of Globtank do not constitute any significant changes of project design character (in accordance with the provisions of article 36a of the Building Law), which require for the re-obtainment of the decision on the obtainment of a permission for the execution of construction works. All of the applied materials posses certificate of the National Hygiene Institute which allows for their contact with drinkable water. The foundation slab within the proposed system is executed in the form of a fixed circular reinforced concrete slab of any desired dimensions. Bottom slabs are reinforced with the application of prefabricated reinforcement grids (less expensive and faster option) or upon Customer request, with the application of a ‘traditional’ manner with the application of rods class A-III N.
The standard applied construction material is concrete of the C20/25 class or higher and of the water tightness amounting to W-8 or higher. Lack of any convex or uneven areas within the surfaces which results in much easier maintenance of tanks and silos, faster execution at a lower cost. Sucking pipeline end section is installed at the level of 20-30 cm over the foundation slab in order to avoid the dead zone located near the bottom of the tank and is finished in straight manner or with the application of a 90 degrees angle section. The relief pipeline is levelled with the surface of the foundation slab. The relief pipeline is additionally secured with the application of a special, openwork drawing basket which is made of stainless steel, which performs the role of securing against any larger elements getting inside the relief pipe. What is also attached to the proposed system is also a special end section which makes it possible for the washing of the relief pipe (at the angle of 90 degrees), which ensures the adequate and correct execution and carrying out of maintenance works and assures that no bacteria or any other unwanted agents or organism develop inside the tank, which could influence the quality of the drinkable water or human health. The location of the pipelines passing through the foundation slab are sealed with the application of sealing flanges. The foundation slab upon the completion of the process of concrete casting. The offered execution of cylindrical tanks made of reinforced concrete is based upon the exploitation of own, dedicated scaffolding systems, which do not require for the application of heavy equipment, the fact that influences the lowering of the costs of execution which translates to lower costs encumbered by the Customer. An additional unquestionable advantage is constituted by the possibility to construct reservoirs in extremely difficult conditions where heavy equipment might have difficulty of access. Walls executed within the system of Globtank are reinforced with the application of prefabricated reinforced mesh and grids (less expensive and faster option) or at the individualised request of the Customer with the application of the ‘traditional’ method i.e. with the application of crossed steel rods of class A-III N.
The cylindrical shape of tank walls is obtained thanks to the application of the set of internal tightening rods and elements. A very important advantage of our system is constituted by the fact that the internal and external walls of the formowroks do not require for the application of tightening rods or ropes the fact that to a significant extent contributes to the reduction of risk of occurrence of any leak in walls, which frequently may occur in the case of the adoption of formwork systems featuring tightening rods, which as a matter of fact are combined with each other within the cross-section of the wall. Thanks to the adoption of such structure the executed walls are seal tight hence there occurs no necessity for the sealing of any openings left over within the walls of the tank. An additional advantage of the solution proposed by Globtank is constituted by the system of sealing of operation openings applied by our company performed with the application of steel tapes manufactured by the company of Frank. reduction of the necessity of the exploitation of heavy equipment upon the premises of the construction site. Depending on the needs the company of Globtank is also able to manufacture the walls which divides the tank into two chambers. Sealing of the foundation of the walls is executed with the application of the manner analogical to the manufacturing of external walls, i.e. by the application of steel sealing tapes. 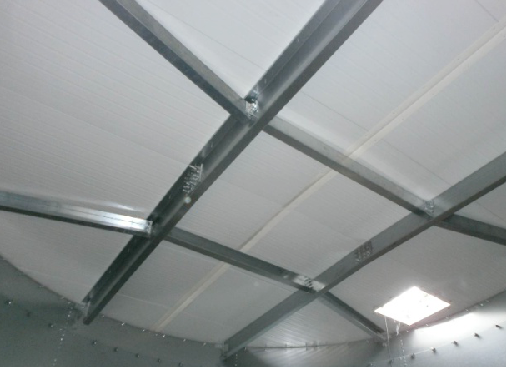 The first method, preferred by Globtank, for the execution of the covering of the tank is constituted by the application of the structure of the roof in the form of galvanised steel profiles with sandwich type of panels attached to them with styrofoam core of thickness amounting to 10 cm. This type of solution is definitely much more economical and may be executed regardless of the atmospheric conditions, which fact additionally speeds up all construction processes. The second but more expensive solution is connected to the manufacturing of monolithic reinforced concrete ceiling slab at the edge supported by the internal wall, as long as such element is present within the given structure. The slab is executed in a flat form without any slope upon which the layer of styrofoam is placed, under which there is formed a slope from the direction of the centre point of the slab in the direction of the edge of the tank. The layer of insulation executed with the application of such manner is covered with the protective layer of concrete of the minimum thickness amounting to 35mm next finished with two layers of thermo-welded roofing paper. 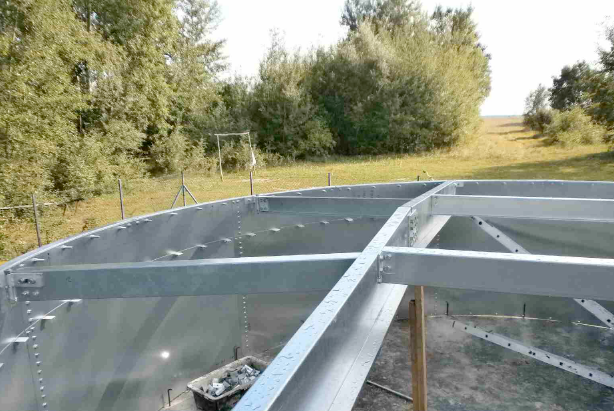 Steel finishing works are executed at the edge of the roof around the whole structure of the roof of the tank. The first option (i.e. the preferred solution) is based upon the manufacturing of external elevation of tank walls insulated with the application of mineral wool and secured with trapezoid steel sheets. The execution of such solution does not depend on weather conditions and considering the process of assembly of the mineral wool minimizes the quantity of openings that need to be performed the fact that definitely has a positive influence upon the tightness of the tank. All of the external elevation steel sheets applied by Globtank posses 25 years of manufacturing warranty. The second option is connected to the execution of the external surface of elevation with the application of the traditional method i.e. fastening with the application of anchor bolts of styrofoam boards along with the manufacturing of mineral elevation placed upon a grid. What needs to be borne in mind is that the hereby described solution is prone to the influence of atmospheric conditions (the possibility to be executed only in the persistence of favourable atmospheric conditions) and may impose negative influence upon the tightness of the tank (especially considering the necessity for the execution of a number of openings indispensable for the needs of the assembly of assembly bolts for styrofoam). The project design is executed based upon 3D modelling of finished elements. The flat bottom of the tank without any cavities is reinforced with steel grids. 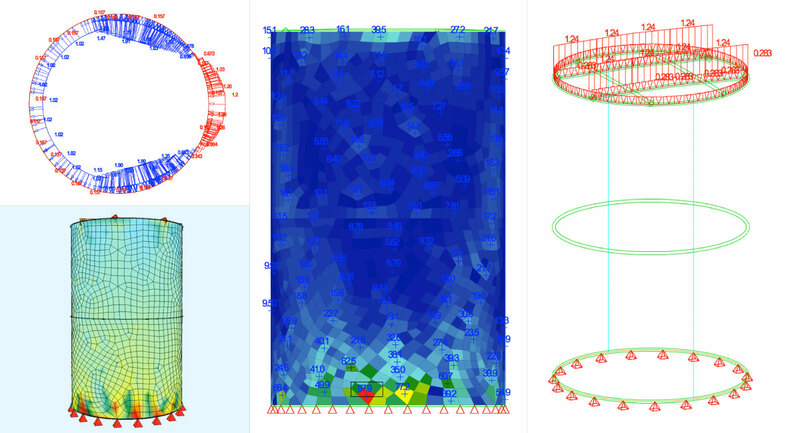 The cylindrical wall is reinforced with the application of reinforcement grids. Own independent system of scaffolding. Galvanised, steel structure of the ceiling slab. External surface of tank walls i.e. elevation made of mineral wool covered with trapezoid steel sheet with 25 years of manufacturing warranty.